The sequel. Even more awesome. I love when I have the chance on this site to track a wine’s development over successive vintages. I love it even more when the wine in question has a strong local connection, something you don’t get to say very often when you’re based in Calgary. Last year I had the chance to write up the inaugural release from Alice May Wines, a new label conceived by Calgary sommelier-turned-wine-agent Alex Good in collaboration with noted California winemaker McPrice Myers of Barrel 27 Winery. 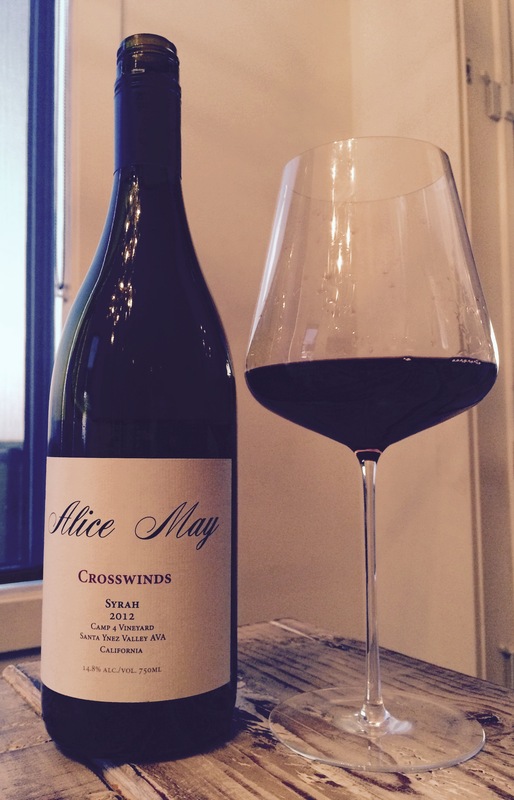 Alice May’s stated focus was on Rhone-based varietals, and its 2011 Crosswinds Syrah was a silky, elegant Cote-Rotie style co-ferment of Syrah and Viognier that I repeatedly sought out and drank over the course of 2014. Having exhausted my supply, I was happy to turn to the 2012 edition of the Crosswinds, and even happier that it carried the Alice May torch with aplomb. You probably put the title of the work and the above passage together already, but the Alice May is the name of a shipwrecked boat that was set on fire to cremate the poem’s titular character, who froze to death on an Arctic expedition. If that doesn’t establish the label’s Canadian authenticity, I don’t know what will. And if you’re wondering, yes, I do now regret the “carrying the torch with aplomb” metaphor I used in the intro. 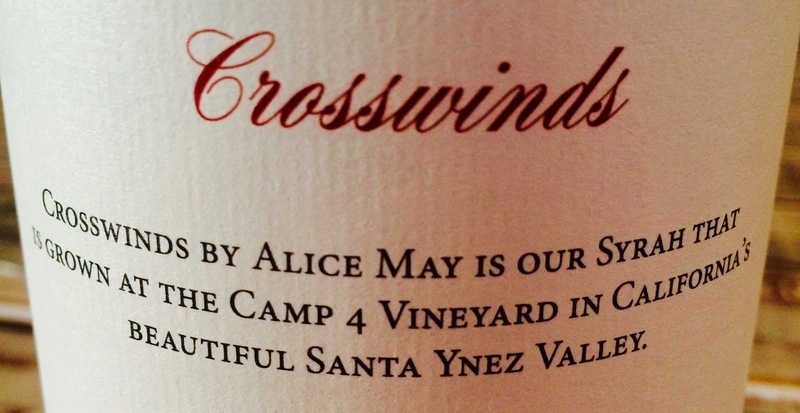 There are two main differences between the makeup of the 2011 and 2012 versions of the Crosswinds: the 2011 was 93% Syrah/7% Viognier while the 2012 is 95%/5%, and the 2011 was sourced from five different vineyards in California’s Santa Ynez Valley while the 2012 is from just one, the highly regarded Camp 4 Vineyard. Owned by the Fess Parker Winery, Camp 4 was planted with 256 acres of mostly Rhone varietals (although there are a whopping 19 varietals planted there in all) in 1999 and saw its first harvest in 2003. Roughly half of the vineyard (130 acres) is planted to Syrah, with Viognier capturing 25 acres. Camp 4 is so named because it was the 4th stop on an Old West stagecoach route out of San Francisco back in the day, located within the confines of the newly proposed Los Olivos District AVA, a 2 hour coastal (non-stagecoach) drive west of LA. Fast forward a bunch of decades and it is a well-known source of quality grapes for many Santa Ynez producers, like this one. Camp 4 Vineyard. Photo credit: Tercero Wines. 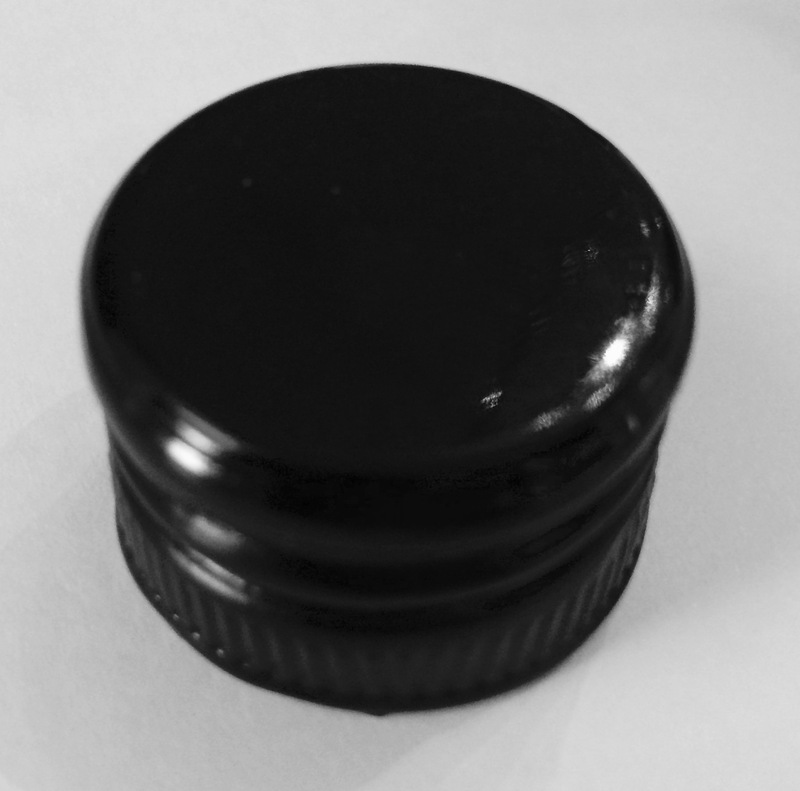 One of the main benefits of co-fermenting a red/white blend is that you don’t end up with the weak pinkish colour you would get if you just blended them together after the fact; the Crosswinds was a good example of this, coming out of the bottle a full, deep, just-shy-of-opaque ruby-purple colour. The nose was an interesting progression from Viognier to Syrah, first sweetly aromatic and playfully floral, featuring accents of honey and fresh bread, gradually melding with Syrah’s blueberry, char, hickory, malted chocolate and charcuterie, like a dessert in a smokehouse. Despite an alcohol level that is far from shy (14.8%), the wine feels bright and lively on the tongue, layered with sprightly yet subtle acidity and waves of smooth rolling tannins. Darker fruits (including, strangely rarely for a wine, grape) come more to the fore here, but a hint of honeyed vanilla and spring flowers still flits among the supporting flavours of spice cookies, cardamom and English Breakfast tea. It never comes across as hot, even leading into the exotic (bergamot, jasmine) and slightly citrusy finish. The 2012 Crosswinds reminded me quite a bit of the 2011, so I went back to my 2011 write-up after the fact and found a ton of similarities in the descriptions of the wines’ flavours, aromas and overall profile. (Given that I didn’t look at my old notes once while writing this and that my 2011 post was written a year and a half ago, I was kind of psyched about the consistency.) Despite the differences in vineyard sources and blend composition this vintage, I think Good and Alice May have landed on a hallmark style for their trailblazing wine, which was executed seamlessly in 2012. The main difference for me between this year’s wine and its predecessor is that the acid and tannin on the 2012 Crosswinds play a more prominent structural role, adding some depth and seriousness to this ultra-pleasurable wine. I found the Viognier a little better integrated too, which Good credited to the fact that it and the Syrah actually ripened at exactly the same time in 2012. When you’re co-fermenting you need to harvest each of your varietals at around the same time, and by the time Syrah is ripe, Viognier is usually way overripe…but little miracles can make great wines. I will keep coming back to this one.